Initiation into Vodou involves becoming a part of a community, a family, and a society. Hounfo Racine Deesse Dereyale accepts initiates from all over the world, and from all walks of life. For those who have been called by the lwa and are seeking initiation, we invite you to view our page on initiation ceremonies to find out what they entail. If you are called to Vodou, if you and the lwa agree that Hounfo Racine Deesse Dereyale is the right house for you, we are ready to welcome you to our family. Before initiation is possible, it is vitally important to ensure that the prospective initiate and the spirits walking with them are compatible with the Hounfo and its spirits. This is accomplished one of two ways: by speaking with a lwa directly, or through a reading. Houfo Racine Deesse Dereyale do not initiate anyone without the permission and approval of the spirits of our house. Anyone who wishes to initiate can contact info@kiwimojo.com with any enquiries. If we have an upcoming fet or other event, the lwa often give advice about initiation to attendees, so we encourage attendance. If we do not have an upcoming event where you can speak to the lwa in person, or you are unable to travel to attend such an event, you will be advised to book a reading with Houngan Liam or Houngan Alistair to determine if you should initiate, at what level, and if Hounfo Racine Deesse Dereyale is right for you. After the Lave Tet ceremony, the new initiate is baptised and accepted into Hounfo Racine Deesse Dereyale as a member of the family with the rank of hounsi semp. Lave Tet ceremonies are performed as and when they are needed, depending upon the number of prospective initiates we have at any one time. We usually offer the Lave Tet ceremony annually, in conjunction with one of the major fet we celebrate. This way, the new hounsis get to enjoy their new role and responsibilities as a member of the house and celebrate with the lwa. Not everyone is called to go through the kanzo ceremony. Those who are called and who choose to answer undergo three weeks of ceremonies in Haiti. 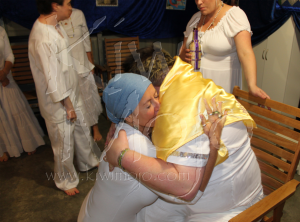 The ceremonies empower the initiates and strengthen their connection to the spirits. Those who are called to the priesthood are elevated to their new rank, and those who are not receive the blessings of the lwa. 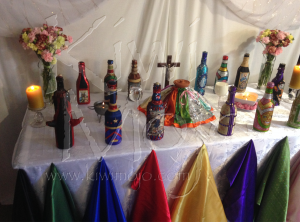 Kanzo is a lifelong commitment: to the lwa, to their service, to one’s spiritual family, and to the wider Vodou community. It is a big step, and not a decision to be made lightly. Those who are called to kanzo and respond by undergoing the ceremonies receive healing, blessings, and a new life in service to the lwa with all the benefits that entails. 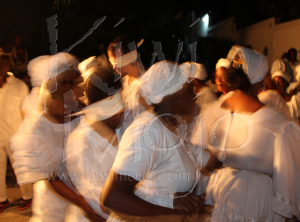 Hounfo Racine Deesse Dereyale do not offer the kanzo ceremony on a regular basis, as we are located in New Zealand and the ceremonies take place at the peristil of Sosyete La Belle Deesse Dereyale in Petionville, Haiti. As our membership is international, we have prospective initiates from all corners of the globe. We need to take into account travelling, coordinating a large and diverse group of initiates, and finding a convenient time for our family in Haiti to help us mount the ceremonies. All this takes time and effort, but it’s an effort we are willing to make. We are open to enquiries, but we do not offer kanzo ceremonies on a regular basis.